FOLLOW THIS EVENT LIVE IN STREAMING HERE: >>CAMNES LIVE! The proposal to organize a Roundtable on the Middle Paleolithic of Italy finds its need among two observations. On the one hand, it is now clear the emergence, over the past decade or so, of new requirements and new methodological implications in the interpretation of archaeological data that is bringing innovative results on the techno-cultural expressions related to the Neanderthal communities. On the other hand, the current difficulty in giving continuity and articulating individual projects on the broader lines of research, prevents any real progress of scientific discussion and especially does not allow effective planning of research on these issues. From these perspectives it is clear both the need for understanding and responding to new trends of research on the Middle Palaeolithic and the importance of directing them towards scientific programmed paths. 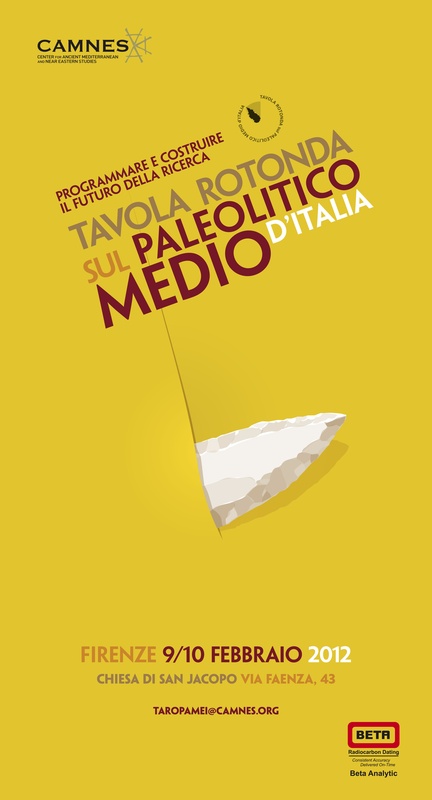 For these reasons, the choice of a Roundtable seems the more functional support for the modernization of these issues and we invite researchers who are tackling research on the Middle Palaeolithic Italian to make a contribution. The initiative takes place with the support and collaboration of CAMNES (Center for Ancient Mediterranean and Near Eastern Studies). We share the aim of enhancing and promoting the renewal of archaeological research through the active involvement of young researchers, in a broader and international perspective. A Perspective aimed at overcoming traditional "borders" by creating a network between different institutions and universities - public and private - involved with continuity and dynamism in scientific research in the prehistoric and historic environments. - Take stock of the research conducted over the past few years. which then refer as a guide for the following individual studies. attention on specific or general issues. Italian territory with a deliberate and systematic approach. Through the first phase of the meeting we aim to reach a general summary of the research projects that are being conducted throughout the territory, a precise definition of the different problematics that are being faced, an organic view of data obtained from recent research and a comprehensive idea about the different perspectives. 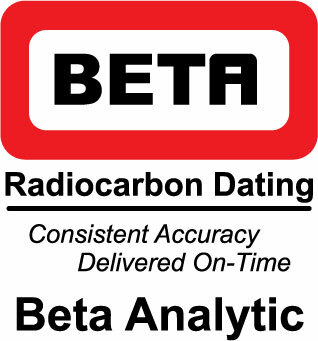 We invite you to bring your contribution by presenting an overview of the research and the results obtained in recent years, paying particular attention to the description and definition of the scientific problematic that are being dealt with and how we intend to develop and strengthen in the future the results obtained up till today. It is also seems appropriate to articulate each contribution starting from a critical analysis of the historical path that developed the related studies during the past. studies have developed and lead to one’s own research. description and definition of the scientific subject that is being faced. exposure of the research project and the results obtained in recent years through one’s own research. how one intends to develop and strengthen in the future the results obtained up to present date. The discussion topics will be set from the issues that emerged during the presentations, with particular emphasis on how these aspects intersect with the objectives of the Roundtable, in order to structure, in a coordinated and joint manner, the guidelines for future research. a. The role of Levallois: emergency and development. b. Evolution and variability of the technical systems of debitage and faconnage. c. Origin and role of laminarity. d. The Middle Paleolithic and the techno-cultural area concept in time and space. e. The transition to the Upper Paleolithic. 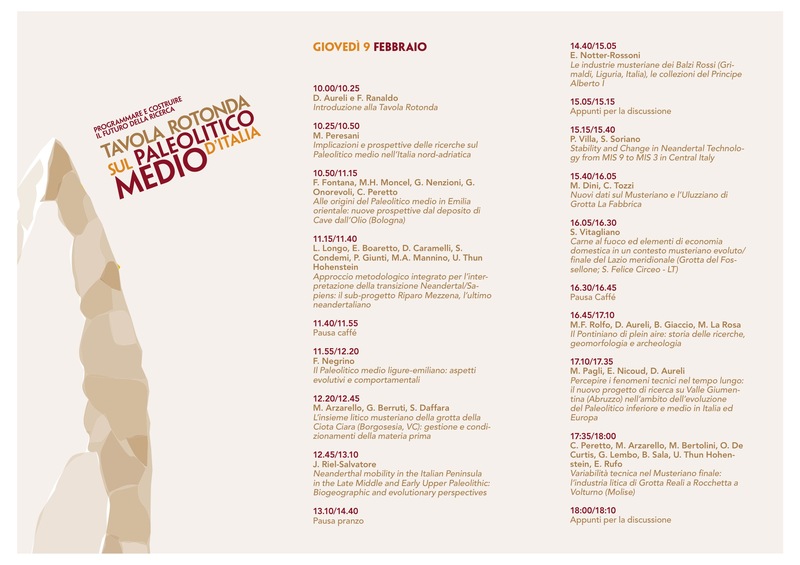 The Roundtable will be held in Florence at CAMNES / LdM during the 9th and 10th of February 2012 in the church of S. Jacopo in Campo Corbolini. 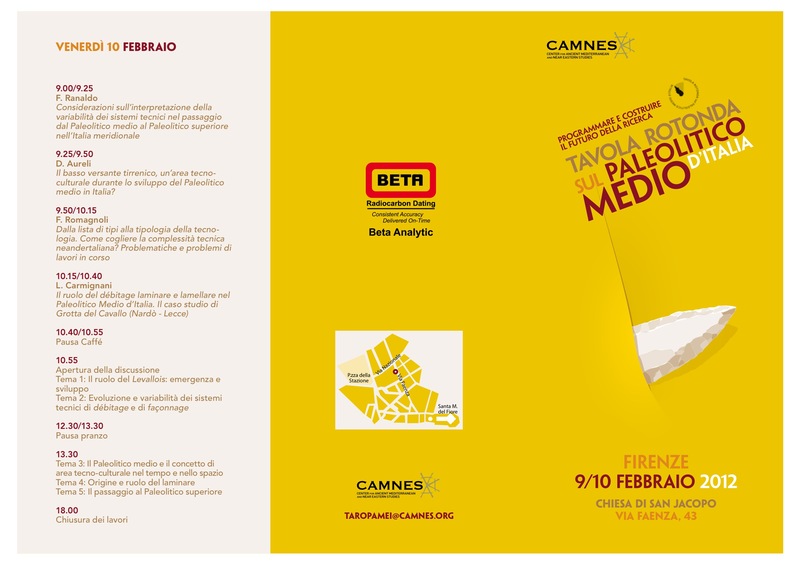 Confident that the initiative itself is a contribution as well as a stimulus to the renewal of the Middle Paleolithic studies in Italy, we think it is important to disclose the contents of the Roundtable through the publication of the proceedings. The 2nd Circular and the Roundtable program is available in the download section.